The Labeo calbasu (Hamilton, 1822) is a threatened fish species (present status: Endangered) in Bangladesh due to the loss of habitats (IUCN Bangladesh, 2000). Successful artificial or induced breeding can be a good option to conserve this species. However, nursing of new born fry is an important step in producing any good and healthy fish seeds. The present findings are based on a survey conducted at the Raipur hatchery complex in Laxmipur district of Bangladesh. 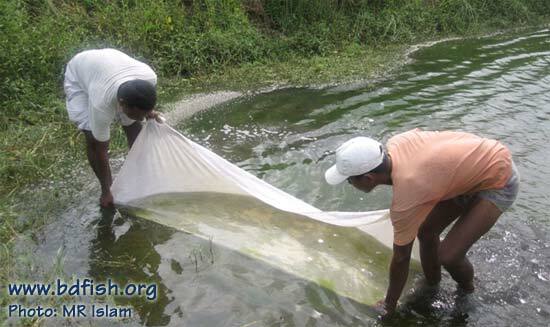 Nursery pond of that hatchery was studied and following findings were recorded. The total area of the nursery pond was 25 decimal (0.012 ha), of rectangular shaped with well developed dyke and inlet-outlet facilities. 2 feet water depth was maintained during the nursing period. Removal of predatory and unwanted fish or other animal species: The herbal poison “rotenone” was applied at the rate of 30 g/decimal to remove predatory and unwanted fish or other animal species from the nursery pond before initial stocking of fry. Pre stocking liming: The next day after applying rotenone, the liming was done at the rate of 600 g/decimal. Pre stocking fertilization: Fertilization is important for producing natural food of fry. Both organic and inorganic fertilizers were used in the nursery pond. Next day after liming, cow dung was used at 2 kg/decimal and urea was applied at 200 g/decimal. Fry collection and stocking: 5-days old fry fishes were collected from the Raipur fish hatchery (Laxmipur) and stocked in the studied pond at the rate of 40 g/decimal. Fish seeds were released in the early morning. Pond monitoring: The pond was monitored regularly with a view to observing water color, availability of natural food and any dead stocked species in pond. Feeding: Regular feeding was practiced to the stoked species. The supplementary feeds composed of wheat bran, oil cake and flour were supplied to the pond. Flour was given after 1 hour of stocking in the form of liquid, diluted in 10 liter water. Again flour was given at 5 PM on the same day. On the next seven days oil cake was supplied. Wheat bran with oil cake were given from 8th day to 60th day. From 7th day to 60th day the feed were given twice a day (in the morning and evening). Daily application rate of these feeds were- flour at 0.08 kg/decimal, oil cake at 0.08 kg/decimal and wheat bran at 0.12 kg/decimal. Sampling: Netting for sampling was done on some occasions by small-meshed net to observe growth of stocked species, diseases and other relevant factors during nursing time. Harvesting: Final harvesting was done when the fry length reached to 2 inches, generally on 60th day after initial stocking. Visited 970 times, 1 visits today | Have any fisheries relevant question? S/He published 2 features. View All.